This was one of my all time favourite animals movie. 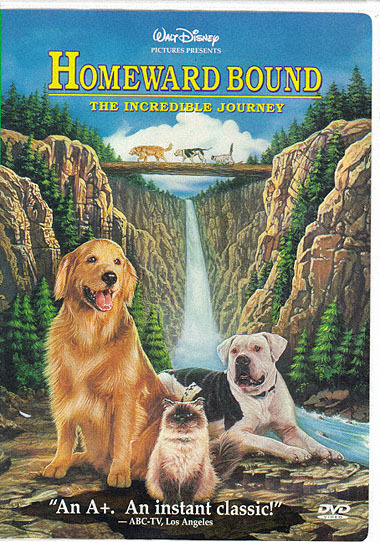 Homeward Bound: The Incredible Journey is a 1993 American remake of the 1963 film “The Incredible Journey” , which was based on the best-selling novel of the same name by Sheila Burnford. The movie was about two dogs (Chance- American Bulldog and Shadow- Golden Retriever) and a cat (Sassy- Himalayan cat) find their way back home to look for their owner. Along the journey, they travel through the river, waterfall and climb up the mountains. They met many interesting and exciting experiences such as how they defeated the mountain lion and Chance even tries to befriend a porcupine, ending up with a load of quills from its tail in his muzzle. It was an entertaining movie to see the talking dogs and cats on an adventurous journey.